Herb Riede, AKA "Rabid Nerd"
I have earned the A+, Network+, Security+, Project+, Oracle JAVA, Microsoft Windows Server and Desktop certifications. I am a Microsoft Certified Professional and Microsoft Registered Refurbisher. We are a member of the Lenovo Partner Program. While we have the knowledge to Tune Up or Diagnose a PC manually, we have the professional tools and software to perform automated, full PC diagnostics, Clean and Tune up your PC, and training to secure your data according to NIST standards. CLICK HERE (exe, 9MB) to download a small piece of software to run on your Windows PC, then give us the 9-digit code via email to Support@RabidNerd.com or through Messenger. We will bill you for your visit according to the rates shown at left. "In Store" prices apply to online, remote help! 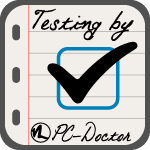 We Use PC-Doctor to diagnose your PC!